ReqView is the requirements management solution for SMBs and enterprises from medical, aerospace & defense, automotive and other industries to comply with SW and system development standards. 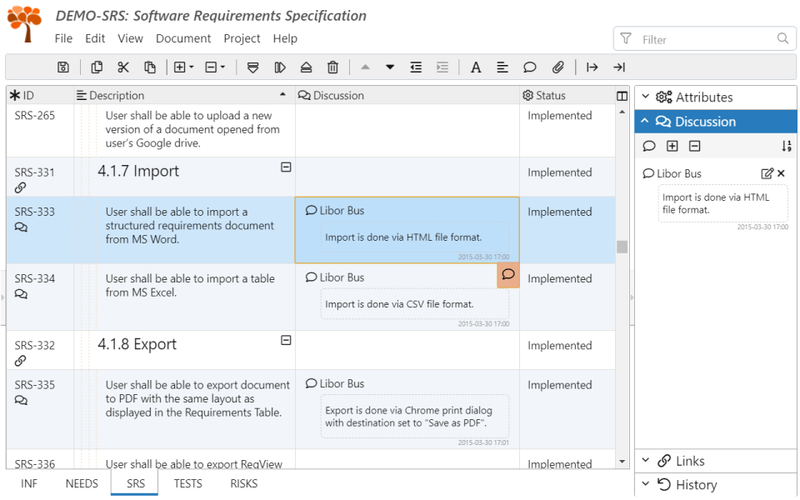 ReqView is a simple to use requirements management tool for capturing structured requirements for software or system products and managing traceability links between product requirements, design, tests and risks. ReqView helps SMBs and enterprises from medical, aerospace & defense, automotive industries to manage requirements in compliance with various industry standards, such as ISO/IEC/IEEE 29148-2018 Systems and software engineering - Life cycle processes - Requirements Engineering. 'Right-sized' between capability versus ease of use and maintenance. Pros: We are a small development group that does not have the bandwidth to justify dedicated resources to learn and customize a complex tool. We have periods of heavy activity followed by months of not touching the tool, so ease of use was at the top of our list of priorities. Additionally, being in the medical device field, we already have many systems in place and do not want to disrupt what is already running smoothly. ReqView is very specific about what it is trying to accomplish, and does it well. It is easy to learn (we have only needed the online documentation) and the pricing makes it a no-brainer to start playing with. The product is definitely a work in progress, with new features being added on a regular basis. A couple of them have been as a result of requests I made personally, so you can't get better responsiveness than that! Rather than trying to do everything, ReqView provides straightforward import and export to standard MS Office software. For version control, we treat it like source code in a Subversion database, but it can be used on a shared drive. Updates are easy and automatic. It's not SAAS, which our IT department would have nixed for security reasons, plus there's not the delay involved with remote servers. 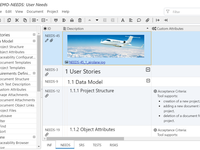 Cons: Customization of outputs to fit the needs of the project documentation is usually a bear, and ReqView is no exception. We had the same issue (except worse!) with previous RM software. Someone who is well-versed in HTML and CSS might find this easy, and there is copious documentation available at w3schools.com, but I admit to spending much more time to generate a half dozen or so output scripts than the rest of the first project in its entirety! Now they are done, so it's no longer an issue for the future, but it was a steep curve. Obviously, if you only need formats closer to those provided, your experience will be easier. 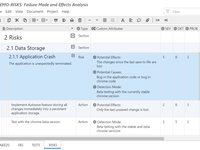 Overall: An easy-to-implement and -maintain requirements management system. It doesn't try and be the answer to everything we have ever needed in our development process, which usually leads to overly complicated software which drives your system, rather than the other way around. ReqView fills just the slot we need it to. Pros: First of all: It's lightweight and not bloated like many other requirement engineering tools. During a relaxed afternoon you'll be able to have played with *all* of its features and have learned how to use it. Also important: The database format is basically just plain ASCII which makes it easy to compare with earlier versions, easy to be parsed by scripts and easy to convert to whatever-you-want. Cons: Currently a licence expires after one year. There are no liftime licences. 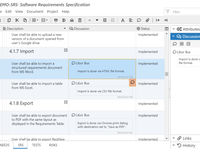 Overall: We use ReqView as the "front end tool" to specify system and software requirements for projects. 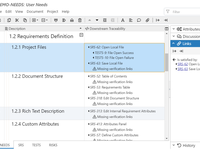 We use ReqViews project concept to include requirement documents from a product line and the option to define custom relationships between documents to extend, append or overwrite generic product line requirements with project specific requirements. The "backend" is a set of scripts which will merge the ReqView files (product line requirements with project specific requirements), convert it to LaTeX and generate nice PDFs - all that automatically in a CI environment. Thank you for your awesome review! We are amazed how powerful automated document generation back-end have you set up. Regarding perpetual license, we are flexible and can offer a longer licence period fitting your needs, for instance PRO license valid for 5 years. Pros: It is a lean tool, which is quick and has good performance. Easy to use, no unnecessary features. It works very stable and it provides all vital functions you need for professional requirements management. Cons: Multi-user support could be improved, merging is difficult. It would be great if vector graphics (PDF pictures) and tables would be supported. An automated PDF-book-export feature would be nice. 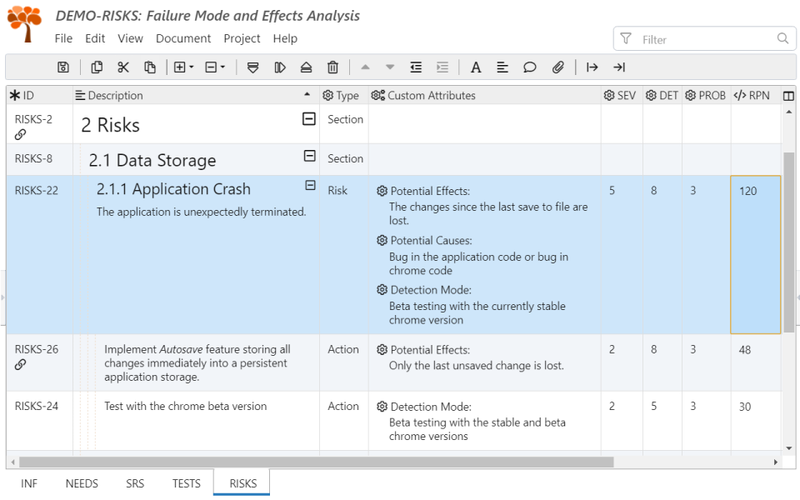 Overall: I use Reqview to manage multi-customer complex projects, including HW and SW requirements. ReqView serves our purpose very well. Thank you for your awesome review! We plan to introduce seamless team collaboration solution in the next major release, the work is already in progress. The other feature requests sound interesting. Lets discuss details on the Feature Request forum. Thank you for your trust and being our customer for almost 3 years. Pros: The software manages requirements very well and allows traceability through the entire Requirements/Risk document structure. The basic functions are easy to use. The ReqView team is very good at tracking user inputs to improve the software and they are very responsive to customer needs. Cons: To use more advanced features requires at least a light knowledge of programming. I was able to figure out the features that I needed and the support at ReqView was very helpful and responsive when I did ask questions. Overall: We are tracking requirements for a product in a highly regulated industry. ReqView allows us to manage requirements and risks from the system level to the component level with full traceability. The function is very similar to a limited DOORS product but at a fraction of the price. Pros: Easy and flexible. Use of standards e.g. json. The csv export is useful. Exporting from a csv is a useful feature, but sometimes it won't work. Cons: I would like tpo have a intelligence in some rows. Referencing others and esecute a small script (e.g. LUA ). I miss the possibility to run two instaces with different projects. Regarding missing possibility for trace / impact analysis, you can generate custom multilevel traceability HTML reports enabling coverage / impact analysis. Please file a support ticket if you are unsure how to use this feature or if you have additional special needs. We will be happy to help. Good news is also that we are going to release soon the first beta of Templated Columns feature which will enable adding custom logic directly in the UI. For instance you will be able to display additional traceability information from the linked objects (even across multiple traceability levels) or display value of a calculated expression (e.g. Risk Priority Number). 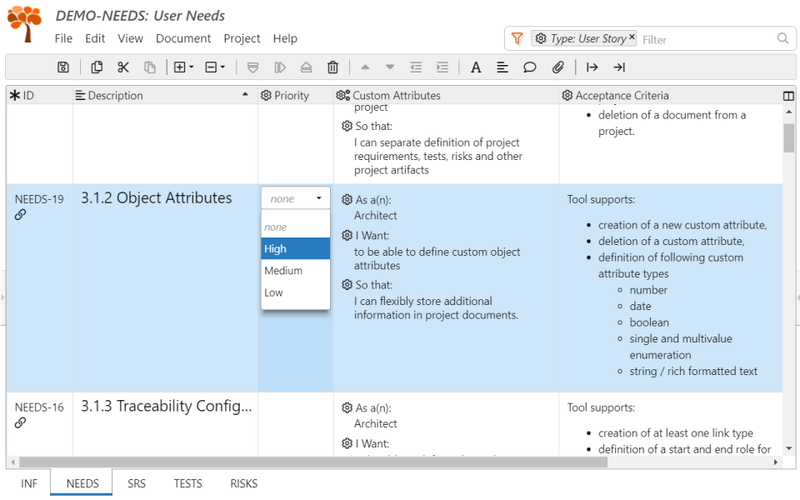 Pros: Very easy to get started with and use, like a spreadsheet specifically designed for requirements. I like the plain text storage, since i can get keep it in a git repo for changes. Cons: some areas are a little too basic + theres some annoying features of the workflow i.e. when jumping between docs the page will often jump to the top when you wanted it to stay on a specific requirement. Thank you for your review. Can you please file a new support ticket providing more details about the issue with jumping between docs which you described? Pros: It's simple and can do the basics without being cluttered. Cons: Some customization (like creating custom attributes, reports etc), is not done a very user friendly way. I got by by copying and editing from examples. Overall: It is a simple and affordable tool (so don't expect it to compete with expensive alternatives) that gets the job done. I am a new user so this is only an initial view. First time I needed support the response was quick and professional. Thank you for sharing your thoughts as a new ReqView user. 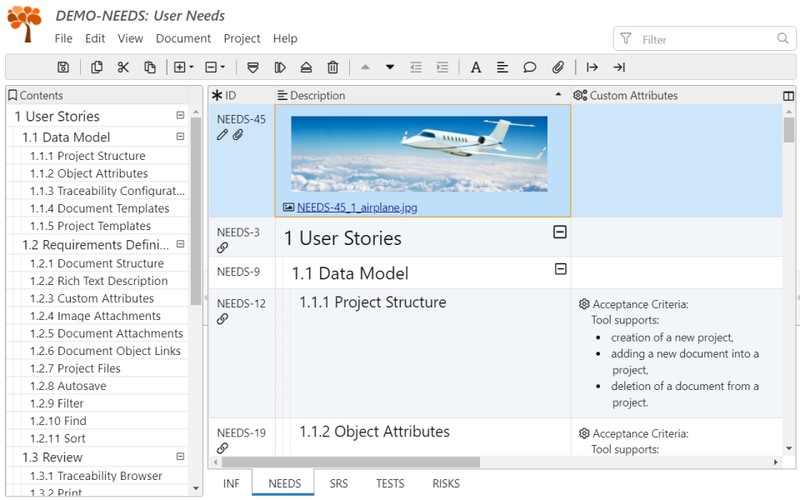 You can set up a requirements engineering project much easier now. 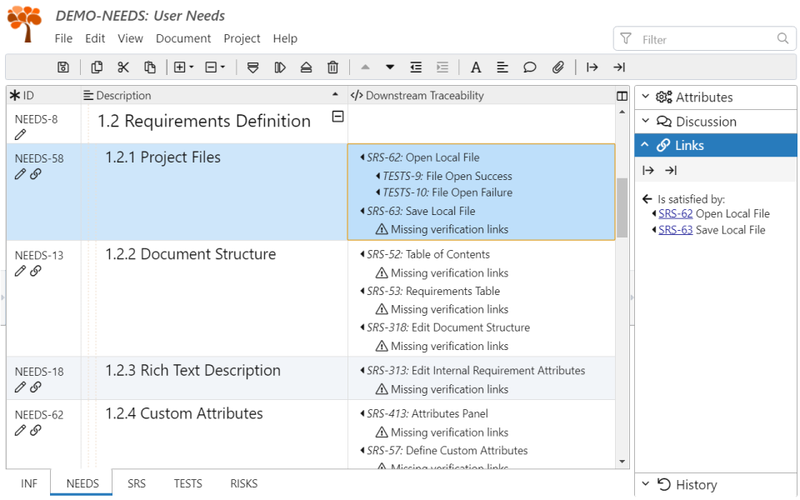 Just reuse new requirements specification templates introduced in the just released ReqView version 2.6.0. These templates are based on ISO/IEC/IEEE 29148 standard and Volere process and they are configured with a common set of attributes recommended by the standard. 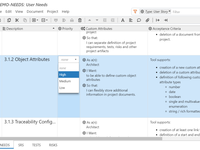 When you create a new document based on a standard template, check the detailed instructions displayed in the right pane for further guidance. Of course, you can still tailor the templates according to your needs. Pros: The software provides traceability within and between documents with customizable outputs. The web-based program makes working from different machines a breeze. Cons: The fields sometimes exhibit quirky behavior. If I am editing a field and switch applications, the text is lost - it works fine, if I change fields before leaving the app; so the work-around is not a real problem. thank you for your review. We will try to fix the problem with loosing edited change when switching applications in an upcoming patch release. Pros: It has apparently been created by people who understand requirements management. It checks almost all boxes that are important to me. It pretty much takes the good parts of DOORS, and leaves out the bad ones. The ReqView team are very responsive, and attentive to the desires of their users. I have great expectations for future releases. Cons: There are currently three different implementations (native app, web app, Chrome extension), all of which are missing a bit of functionality that's important to me, even though other implementations have it.